The Cook's Tour: Food.Baking.Travel. : Lessons from "Baking Fails"
A few weeks ago, I came upon a recipe for a cookie that caught my eye. 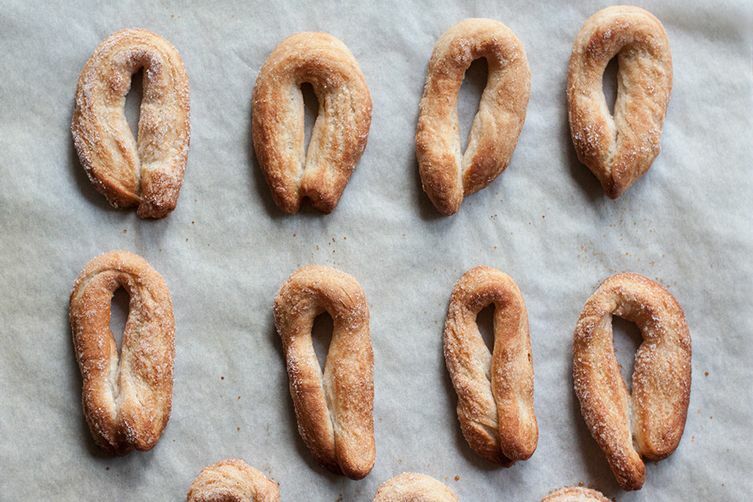 It’s called “torcetti,” a type of old-school Italian sugar cookie. It’s a bit unusual as it is made with yeast, which most cookies do not have. Besides yeast, the recipe called for European-style butter which I had never used so this intrigued me. I gathered up the ingredients and went to work. But first a little history. According to the website, Turin Epicurian Capital, these cookies date back to around 1700. An article supposes that during around that time, while waiting for bread to bake in community ovens, some of the bakers took leftover dough, shaped it into a type of breadstick, coated them with sugar or honey, formed them into little “twists,” and baked them. Voila - torcetti! There are a zillion recipes for torcetti out there. I used one from Food52, one of my trusted sites, and I liked the fact that it recommended an overnight rise. My first pangs of fear that this was turning into a “baking fail,” was trying to incorporate the butter into the dough. It took forever and a lot more flour than called for to get a non-sticky, manageable dough. Finally, it came together! Since I was utilizing the overnight rise, I covered the dough with plastic wrap and placed the bowl in the fridge. But I really didn’t want to toss the whole thing out, so I preheated the oven to 250 degrees, turned it off, shoved the covered bowl in, and waited. I figured I had nothing to lose at this point. In about an hour, the dough had magically doubled in size. I was thrilled! Maybe this wasn’t going to be a wasted effort after all. Again, I went back to the directions: rolled out the dough to the stated dimensions, cut the strips, rolled in sugar, and baked them. Twelve minutes later, I had the saddest looking cookies on my baking trays. But, I thought, even if they don’t look great, if they taste good, I’ll be happy. Let me cut right to the chase here and not keep you in suspense (although I'm sure you've guessed the outcome): they were terrible! Heavy, dense, tasteless. I was so disappointed!I threw them all out. So what did I learn from this? I rediscovered how much I LOVE working with yeast dough! The last yeasty-type recipe I made (a few years ago) was the fabulous brioche from Joanne Chang of Flour Bakery in Boston. The smell as I worked the dough was intoxicating. And kneading it put me in an almost zen-like state. There is definitely something to be said for how baking can be relaxing and reduce stress. I’m not sure why my torcetti did not come out as they should (I don't think it was the recipe); perhaps the yeast was old (even though the expiration date was months away), maybe I overworked the dough? Who knows? Will I attempt them again? Definitely. I know a lot of people may not feel that baking is relaxing, but if you focus on the physical activity of rolling or kneading the dough, enjoy the smell of the yeast or the spices in your recipe, you’ll most likely forget about what else is going on in other parts of your life - the daily stresses - at least for awhile. Making these torcetti reminded me of the pleasures of baking. Have you had a baking fail that you’ve learned from? Leave a comment below.